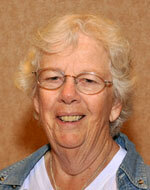 Hello, my name is Nancy Oster Heydt and I am the coordinator of the Brick Wall Solutions Special Interest Group. We meet the fourth Wednesday of each month from 8:30 a.m. to 9:30 a.m. in the Savannah Regional Recreation Center, 1545 Buena Vista Boulevard. No meetings June through August. If you have a question about this SIG, send me an email with your question and I will respond as quickly as I can. We discuss each member's brick wall, suggest research methods for a solution. Each member is encouraged to download and complete the worksheet listed below so we can take the problem home to approach it from different perspectives. We also discuss research techniques and standards of proof. Everyone has a turn to discuss their brick wall. We have had many successes, but there are always those walls that just will not collapse; often because we are misdirected to look in the wrong place. You must be a member of The Villages Genealogical Society to participate in our meetings. There is always room for new attendees as it is a roll-over group.